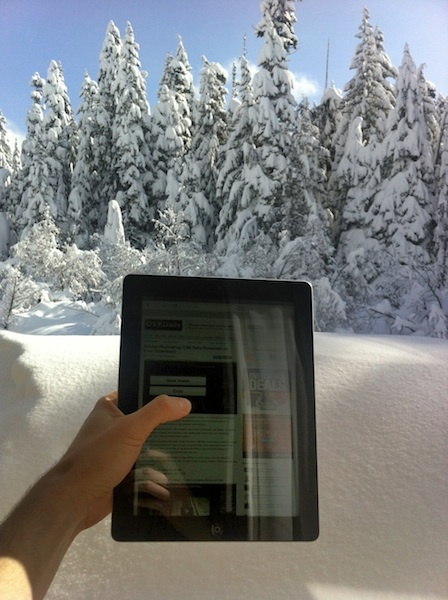 If your iPad 3 is getting too hot to handle, the solution is to use the iPad outdoors in three feet of snow. Three feet of snow is required because there is a direct correlation between the iPad generation and the amount of snow required to cool the device, thus iPad 3 requires 3 feet of snow. For those of you who don’t have access to three feet of snow, try placing the iPad 3 in a freezer at least three feet under ground, while holding three fingers in the air for at least three seconds while counting backwards from three. This is obviously a joke, and you’ll notice we haven’t mentioned anything about the mythical iPad 3 heat problem, mostly because it doesn’t exist and we don’t want to reward manufactured controversy. This was funny enough to post on a Friday though, so enjoy a tip that’s about as useless as the original Consumer Reports BS that started it all. I do too and I published it, now what? All that snow is going to melt because of the iPad! The iPad is causing Global Warming! OH MY GOD! What shall we do now? Is this the End??? What a ridiculous article. Such a waste of time. I was able to cook a steak, baked potato and onion rings on my iPad in 5 minutes. It came out good and was delicious. Bad photoshop work (look at the reflections …) topped by bad writing and humoristic skills. I live up north, I love the idea of the ipad 3 warming up my hands as I use it. no, I’m not joking I’m dead serious.